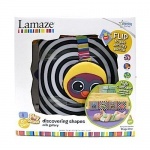 Different parts spin, click, rattle and encourage baby to grasp and turn. Includes bendy stem, knobbly rings, plus chunky beads which slide around colourful wings that double as teething rings. Bright, bold colours stimulate vision, rattles promote hearing. Ideal for babies from birth and up.